Like most folks I have lots little collections. Some groupings are borne of necessity — for example, I have a lot of Mid Century Modern housewares because I need things like furniture, dishes and pots and pans and when I moved out of my parent’s home and set up housekeeping on my own, that style was plentiful in thrift shops. And as I continue to furnish my space, I’m still attracted to the style ‘cuz it works well with my existing decor. Then there are weird, ancillary collections. 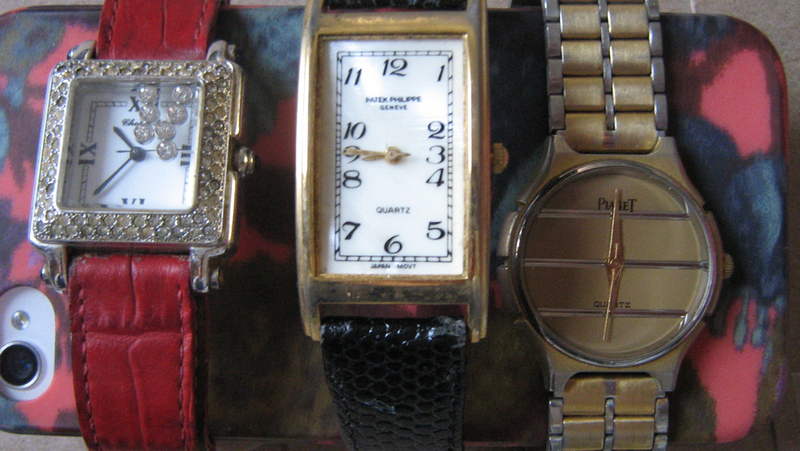 Like the knock off watches shown here. I love watches. I collect the real things but I am on a very limited budget. One of my strategies to score interesting timepieces is to buy inexpensive lots of jewellery in the hopes that the seller has overlooked a real gem. For example the fake Chanel Premiere was part of a lot that contained an authentic Torun Bulow-Hube for Georg Jensen timepiece. The bogus Admiral’s Cup was part of a group that contained a real Wittnauer — not as pricey as a genuine Corum, but the other bits and pieces all paid the price of the gamble. 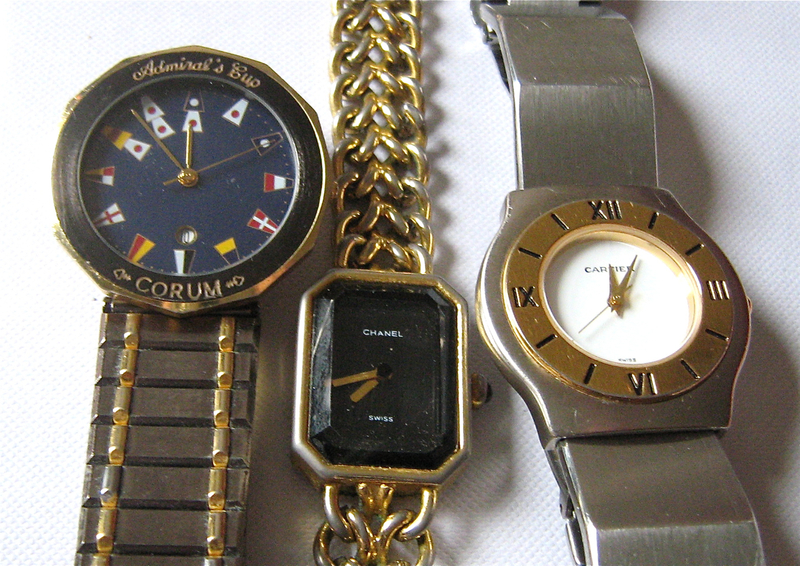 Which brings us back to why I have a collection of fake watches: I could never knowingly sell a knock-off. I can’t even in good conscience donate them to a thrift shop. And most of them aren’t even good enough fakes to use as props. I mean look at the Patek Phillipe — one of the most prestigious of Swiss watchmakers and it says Japan Mov’t on the dial. And Cartier never made a watch that looked like that.